Choosing how you want to engage with your members isn’t always easy. There are countless tools in the marketing space, and some are demonstrably better than others. In this blog, we’ll explore which is better: email marketing or automated marketing for your credit union. To compare email vs. automated marketing services we’ll talk about a few things: member relationships, digital engagement, and marketing efficacy. If you work for a credit union marketing department, then this blog may be of particular interest to you. I still miss the days when I was a member of Idaho Central Credit Union—I used to ride past my local branch, and a friendly employee would be outside grilling. I’d get a free hot dog (or two) and an iced tea and chat with them on the lawn. One of the things that struck me about that kind of member engagement was that it was so casual. It met an immediate need of mine: I was hungry, and they had food. However, the most interesting part to me was that—although it was for member appreciation—they offered food and beverages to anyone walking by. Anyone! When I think about how best to engage members—prospective and current—I think about what kind of value can be provided. ICCU hosted those little lawn cookouts not just to thank their member, but to remind their members that they care. Plus, they invited others to the party in a low-stakes, casual atmosphere. Which leads me to my larger point: a close, personal touch is always better for strengthening member relationships. Which Option Improves Member Relationships? Email is an integral part of the way people and businesses communicate. There’s no denying that it’s effective and efficient. However, email is a one-sided affair. People don’t respond to credit union emails. Sure, they may open them—and opening the email can tell the credit union a good deal of pertinent information. Still, it’s limited engagement on the member’s part. The other reality is that email marketing campaigns can’t always tell when to engage with members. A credit union might send out an email to 10,000 members, of which 10% will get opened. Sending the same email a week later to the members who didn’t open it will garner the same interaction rate. The problem with email marketing campaigns is that they can’t be customized to fit an individual member’s preferences, habits, or needs. Similarly, they can’t identify specific products or services tailored to a member’s digital engagement profile. When comparing email marketing vs. automated marketing for credit unions, it’s critical to measure digital engagement. Email marketing campaigns allow you to see your members’ interaction with your emails. That knowledge is critical, and it can inform your marketing team how to proceed. Automated marketing programs do the same thing. Additionally, they also track member engagement in social media, on your website, and any other relevant online portal. After only a short period of time, automated marketing programs can tell you important details that can shape the way you interact with your members. Instead of knowing that a member opened an email—or tends to open certain types of emails—you can learn about their financial habits, their preferences, what services they might need, and any significant life events that concern the credit union. One of the best features of automated marketing platforms for credit unions is the flexibility and control they provide. The lead scoring in particular is what keeps marketing automation software at the cutting edge. By tracking the digital engagement of current and prospective members or clients, automated CRM tells your credit union about who’s interested in what, and when. Email campaigns call tell you who clicked on your email. They may also send further triggered emails. Which Is Better in the Long Run? I shared an anecdote about ICCU at the beginning because it had a lasting impact on me. I lived in Boise only for a few years while I finished graduate school. Nevertheless, they left a strong impression on me, and I think they’re a model for how to meet, engage with, and ultimately understand their members. Credit unions who want that personal touch won’t be well-served by email marketing campaigns. Email marketing still has a very important place. However, the limited functionality and flexibility of email-only marketing can’t keep up with the robust online data that members generate daily. If you want to establish a meaningful, engaging relationship with your members, you can’t rely on outdated technology. Not when there are better options at your fingertips. If you’ve made it to the end of this blog, then I hope I’ve adequately introduced why automated marketing is the future for credit unions. I also hope you watched the video, because it puts some of my points in better perspective. We update our blog regularly with tips, tricks, and insights about the credit union industry. If you’d like to read more about marketing automation software for credit unions, follow the links below! 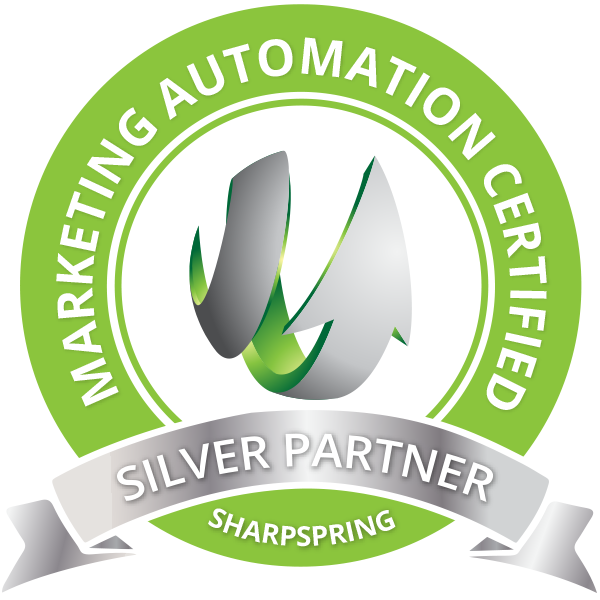 Remember, CU2.0 is SharpSpring certified and can help your credit union navigate the rapidly evolving marketing automation space.